Within the past year alone the Haddad Administration has installed over 150 miles (240 km) of bike lanes, with a goal of reaching approximately 250 miles (400km) by the year’s end. [ii] The speed at which this has happened has shaken up the status quo producing both praise and sharp criticism. 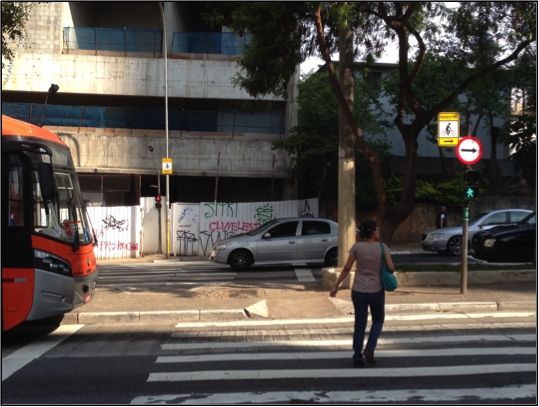 While, São Paulo residents overwhelmingly approve bike lanes (80%) and exclusive bus lanes (91%), according to a 2014 survey by the Datafolha polling agency, only 4% of respondents said they bike daily. [iii] While it will take time to change the culture of the city towards cycling, this article suggests that Haddad could have an even greater cultural impact with even broader political support if he focuses his energy on a mode of transportation that cyclists and car drivers alike engage in: walking. 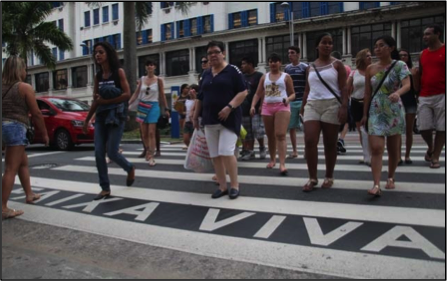 Haddad has said that he wants to “humanize” the city, and what mode of transportation is more human than walking. While this article does not purport to speak with transportation engineering expertise, it does highlight the daily experience of pedestrians, and makes recommendations on fixes that could both significantly “humanize” the city, and gain political support. While many of the main streets have pedestrian signals, the side streets often lack them. This leaves pedestrians to use their own judgment on when it is safe to cross, which increases risk of accidents. Safety should not involve guesswork; let’s install pedestrian signals at all intersections that have traffic lights. Once you install pedestrian signals, they have to be long enough for “grandma” to cross safely. Because pedestrian signals can be notoriously short, and crosswalks are not always straight, I often see pedestrians running to make it across on time. On more than one occasion I’ve seen an elderly person simply not make it across in time, and guess what? Traffic has to wait for her anyway. This is hardly a “humanizing” way to navigate the city, and reinforces the car-centric notion that the pedestrian is the problem. 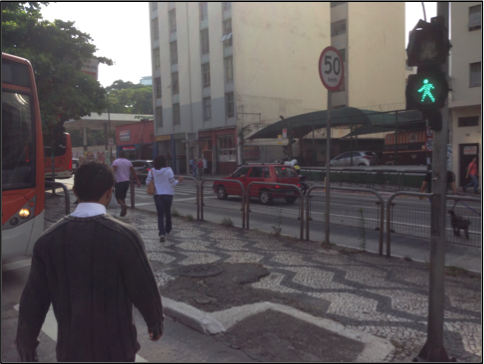 On Paulista Avenue, the most prominent street in the city, pedestrians have to cross eight (8) lanes of traffic going in different directions. Thankfully, when the pedestrian signal turns green, both sides of the Avenue are stopped. This does not happen everywhere in the city, and needs to. 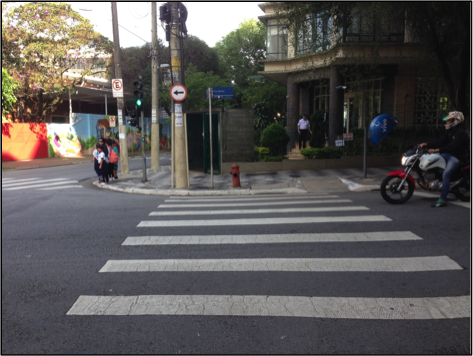 Lack of coordination doubles pedestrian waiting time, and consequently tempts people to cross against the signal. 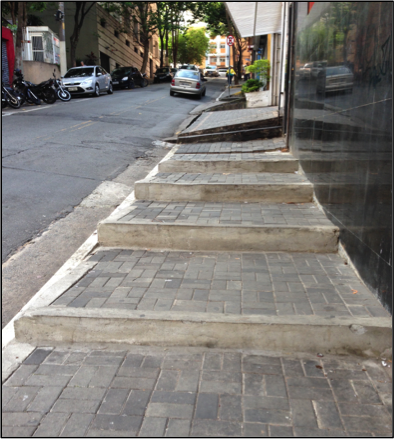 São Paulo overall has some of the best-paved roads in all of Brazil, but some of the worst sidewalks. This fact alone speaks volumes about the challenge Haddad faces. This general lack of walkability, especially as you get away from the city center, is especially taxing on the handicapped and people with baby strollers. While there are many legal and fiscal reasons why this might be more challenging than paving new bike lanes, for example, what better way to “humanize” pedestrians than to repave and expand sidewalks? To be fair, Mayor Haddad has included “widening” sidewalks as part of his overall strategy, but if he truly wants to make a difference, he should pursue improving sidewalk accessibility with greater zeal than installing bike lanes. Mr. Haddad is a visionary and deserves a lot of credit for his political courage to tackle an issue that as stymied the city for decades. I would simply caution Mr. Haddad that in his zeal to fight for bike lanes, not to forget to prioritize the most vulnerable and fundamental mode of transportation in the city: walking. [i] Romero, Simon. “Fighting Resistance, a Mayor Strives to Ease Gridlock in a Brazilian Megacity.” 04 Oct. 2015. <http://www.nytimes.com/2015/10/05/world/americas/mayor-fernando-haddad-of-sao-paolo-strives-to-ease-gridlock.html?_r=0&gt;. [ii] Rodrigues, Artur. “Gestão Haddad prioriza centro e deixa ciclovia da periferia de SP na lama.” 08 July 2015. <http://www1.folha.uol.com.br/cotidiano/2015/07/1653029-gestao-haddad-prioriza-centro-e-deixa-ciclovia-da-periferia-de-sp-na-lama.shtml&gt;. [iii] Johnson, Reed and Rogerio Jelmayer. “Mayor Fernando Haddad’s Pro-Bike Push Polarizes São Paulo.” 23 Sept. 2015 <http://www.wsj.com/articles/mayor-fernando-haddads-pro-bike-push-polarizes-sao-paulo-1443031374&gt;. [iv] “Faixa Viva completa quatro anos com redução de mais de 60% nos acidentes.” 08 May 2015. <http://www.jornaldaorla.com.br/noticias/18425-faixa-viva-completa-quatro-anos-com-reducao-de-mais-de-60-nos-acidentes/&gt; . Anthony Scott is a Master of Public Administration dual degree candidate at the School of International and Public Affairs (SIPA) at Columbia University and Fundação Getulio Vargas (FGV), Brazil.